I can’t complain about the 3D, because I saw it at a drive-in. I won’t critique the CGI, other than to say it’s amazing how much emotion filmmakers can pack into characters that exist only in pixels. Shadows falling in the wrong places or not at all? I didn’t notice. 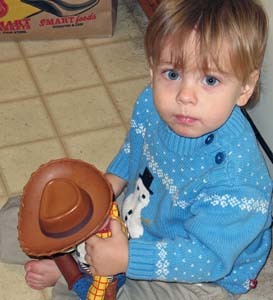 So when a friend suggested a few weeks ago that we load the kids into her van and see “Toy Story 3,” I was ready to go. So were the guys – Big Guy a little less so because he’s too sophisticated to admit enjoying kiddie fare though the novelty of a drive-in appealed to him. The visit to the drive-in – my first since I was Boots’ age – is part of what forever etched “Toy Story 3″ into my brain. Strangely, all three films have wound up being memorable events for me. It was only a few months later that our little gang of four was blown to bits when corporate sent someone in late on a Friday to ax the two highest salaries in our building. I was one of them. By the time “Toy Story 2″ came out, I’d migrated to California and befriended two young girls who had to see the movie the weekend it came out. I was the one who was insistent on that point. I’d been dating my future husband for only a few weeks, so asking him to go with us was an early litmus test. I was too old at that point to waste time dating someone who won’t take kids to a movie. We became engaged a few months later. The oldest of the “kids” got married in May. “Toy Story 3″ closed the arc for me when Andy said goodbye to Woody, Buzz and company. As my eyes darted from the screen to the kids snuggled in the back of the van, I could see myself in a few years, not bidding farewell to playthings, but letting go of my babies as they, like Andy, head away from home. I was thankful that, in the cover of darkness, the guys didn’t see the tears at the corners of my eyes. I know that when the movie comes out on DVD the guys will want to buy it, and I’m sure I will. They’ll watch it to see Ken get dissed, to boo Lotso, to hear Buzz’s over-the-top wooing of Jesse. In a few years, though, they’ll see it differently. The movie was soooo good. I got a little teary eyed at the end myself just know that this was it. They really tied everything up and it was so easy to make parallels to real life.